–Ted Strickland, State of Ohio Governor 2006-2010. Physical punishment is one of the most serious public health problems of our time. Nadine Block has written a superb book which addresses this issue on personal, national, and international levels. Breaking the Paddle is poignant and inspiring. If hitting a child is not wrong, then nothing is wrong. Block makes this case brilliantly. –Paul C. Holinger, M.D., M.P.H. At the time when efforts to bring American school children under the cloak of fundamental human rights guarantees were in their very earliest stages, and calls for reform consisted of a mere few, faint voices in the wilderness, Nadine Block entered the scene. She quickly became a key player. Today, thanks in large part to her efforts, that voice in the wilderness has grown into a grand chorus, and the reform we yearned for — extending to school children the same fundamental legal protection against assault and battery that applies to everyone else — is now within grasp. Thank you, Nadine! 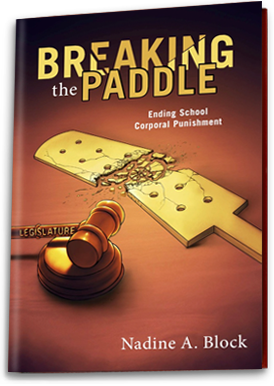 And thank you for sharing the poignant details of your journey in Breaking the Paddle: Ending School Corporal Punishment.